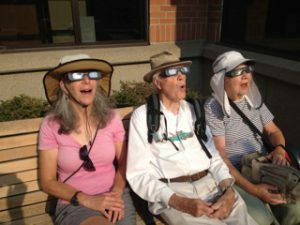 Viewing the Eclipse in Ashland, OR, with Don and Judy. As we promised last entry, we returned to Ashland to see the rest of the plays of the 2017 cycle, and this time our daughter Judy and her boyfriend Erik came up from California to join us. Before the plays began, we had a special, very busy day. In the morning of August 21, we viewed the total eclipse that was visible all across the country, but not in southern Oregon where we were. 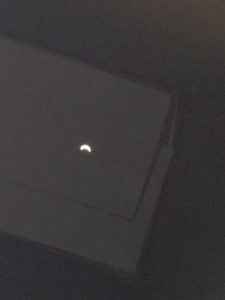 We saw only a partial eclipse, but still it was very dramatic and awe inspiring. We sat on a bench near Lithia Park, put on our dark glasses, and prepared to be stunned. The moon crossed the sun starting from the top and slowly moved down until only a little sliver of sun–like a new moon–was visible. People came out of buildings around the street. A family with two young girls joined us, but they didn’t have the right glasses. We shared our glasses with them, and also the pinhole camera that Don had made from a cereal box. Judy helped them focus the camera so everyone had many turns, and Erik took a picture through the pinhole camera. We let the girls keep the camera. More than the scientific miracle of seeing an eclipse, what remains from the morning is the feeling of community among all the people watching the eclipse, sharing their glasses and connectedness. The rest of the day was a celebration of Daedalus Day, an annual event of the Oregon Shakespeare Festival to raise funds to fight HIV Aids. This was the 30th year of the celebration, which has raised over a million dollars, distributed over local, state, and national entities fighting Aids. In the afternoon there was a play reading and in the evening a review where the highlight is the Parade of Underwear, where cast members, backstage workers, volunteers, ushers, all parade across the stage and out to the lobbies, where audience members can tuck dollar bills into their underwear or into buckets they carry. Both events were packed! The play this year was CABARET, an appropriated choice for current times. I had seen Cabaret many times before, so I thought I was prepared for the shocking moment at the end of the first act when the Nazi begins to sing “The future belongs to me,” and slowly, slowly the others join in until the stage is full of Nazi sympathizers. As the volume grew, I thought I heard the man sitting next to Don join in to the singing. I was stunned, repulsed, and frightened. I leaned forward to see what he looked like, and I saw that the singer was not in our row, but standing up in the row behind us. Then other voices joined in from all over the auditorium. I was so shocked and angered that I began to boo! “Boo, boo, boo!” I yelled. I’ve never done anything like that before. It is so unlike me. Then I looked closely at the singers scattered through the audience, and I realized that they were company members. Looking back, this was the most emotionally charged event of the week, but I will continue to describe the rest of it. Over the next four days we saw four afternoon plays. HENRY IV Parts One and Two were excellently done, though it was a disappointment that G. Valmont Thomas, a Seattle and OSF actor, and a University of Nebraska faculty member, was ill and not able to play Falstaff. His understudy, Tyrone Wilson, did a fine job, all without book, though his understudy still needed a script. Daniel Jose Molina was an excellent Prince Hall. I liked seeing the two plays one day apart, with the same actors returning to play their parts. I said in my review last May when we saw UNISON, that I found the play confusing and hoped to see it again later in the summer. Last May I wrote, “In the play, a poet dies, his Apprentice opens the forbidden chest and releases seven Terrors, characters representing events and people from the poet’s past. The poet is recalled to this world to resolve the unfinished issues. (This explanation I copied from the program.) The Terrors are Seamstress, Butcher, Boxer, Black Smith, Hunter, Momma, and Soldier.” Well, we did see it again, our third afternoon at the festival. Last spring, I had my program open in my lap and I tried to make sense of the Terrors and what fears they each brought. This time I watched and listened and the whole composition jelled and made sense for me! This time, I just watched the play unfold as a man looking back at his life. Much more meaningful–regrets, unanswered questions, unspoken gratitude. I’m glad we went back. The last afternoon at the festival we saw a play I had been looking forward to for a whole year. In August 2016 we shared a shuttle to the Medford airport with Randy Reinholz, who introduced himself as a playwright who was in town to discuss his play with Bill Rauch, Artistic Director of OSF. The play, he told us, was set in an Indian school in Genoa (Jen-OH-wah) Nebraska, a town neither Don nor I had ever heard of, and we were both born and grew up in Nebraska. Nor had we ever heard of Indian schools there, although we knew about them in the Northwest. These were schools where children from many different tribes were sent to lose their Indian languages and culture. ON THE RAILS, his play, is based on Shakespeare’s Measure for Measure. Lots of music and dancing, and not at all like the Nebraska we remember. We both recommend that you see it, and hope that a local company brings it to Seattle. There is not as much to say about the evening plays in the outdoor Elizabethan theatre, because smoke blowing down the valley from forest fires in other parts of Oregon so polluted the air that two of the three plays were cancelled. We missed BEAUTY AND THE BEAST and THE MERRY WIVES OF WINDSOR. I felt especially sorry for the little girls dressed in their Disney princess dresses who missed out on the first play. I’ll never know how K.T. Vogt would have played Falstaff or how the deaf actor, Howie Seago, would have played the Host of the Garter. But on the third night, the wind picked up, the air cleared and we thoroughly enjoyed seeing Mary Zimmerman’s THE ODYSSEY, which we had seen once before at the Seattle Rep.
We have been attending the Oregon Shakespeare Festival since the mid-’60s. We have sat through blistering afternoons in a hotel pool and cold, rainy evenings wrapped in plastic garbage bags trying not to rattle the plastic, but we never ever before missed a play. This entry was posted in Family, Oregon Shakespeare Festival, Shakespeare, theatre, Travel, Uncategorized and tagged Oregon. Bookmark the permalink.